Have you ever met anybody who uses the term “Serial Entrepreneur” as a job title? I’ve seen many humans use that self-proclaimed moniker lately, and frankly, I’m not impressed. Even if they leave off the tongue-in-cheek “Serial” and just go with “Entrepreneur,” I’m still led to yawn. What kind of title is that? What does that really mean? I contend the real entrepreneurs, those who are worthy of the moniker, are those who first and foremost identify themselves otherwise. Retailers, bankers, moms, IT specialists, repairmen, marketers, mechanics, programmers, clerks, managers, analysts, artists, healthcare providers—whatever… The real entrepreneurs have enough work-a-day world perspective to know how to identify market problems and create solutions and have likely done so in the context of their jobs all along. While I acknowledge that some professionals are flat-out gifted in the creation and launching of businesses, I find those touting the “Serial Entrepreneur” title are typically motivated by self-promotion—not by providing practical solutions for marketplaces in need. “Serial” implies “compulsive,” “predictable” and “redundant.” Those aren’t exactly the qualities desired in someone who’s going to foster new directions for business or invent something I’m led to buy. While so many of those “entrepreneurs” are tweeting about their latest “ideating and innovating,” there are some hard workers with their sleeves rolled up, tinkering on the next solutions and inventions that we’ll all be buying. In the last two years, I’ve discovered my inner entrepreneur. I’ve transformed from “employee” to “business owner.” I’m starting new endeavors—yes—but I have no desire to be titled an “Entrepreneur.” The endeavors I’ve started are born of my intimate understanding of marketing and my ability (based on experience) to create solutions for my clients’ needs. 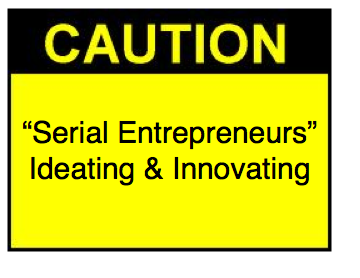 As for that idea of “serial entrepreneur”? I figure if I’m any good at this entrepreneur thing, there will only be so many times I have to attempt it. I want to build businesses that bear fruit long term—because the solutions I provide are so undeniably helpful and important to customers. Beware those who trumpet their “Entrepreneur” titles too loudly. Those who actually qualify for the title are too busy working, managing, researching, testing, checking and reworking to toot their own horns. But keep your eyes open for those hard-working types; they’ve got the next Big Thing you’re gonna want or need! This entry was posted in Big Biz Tip, Business trends and tagged entrepreneur, entrepreneurialism, serial entrepreneurs, small biz big time, Small Business. Bookmark the permalink. Interesting point. Entrepreneur is a French word reserved for the grave digger who buried plague victims. Certainly a high risk high reward occupation. It is fair to say most of the above titles do not fit the bill. Artists and marketers perhaps, but artists do it for the art – a reward in its own right. Same goes for moms, the reward is in the doing. At least I suppose it is, but dad is my frame. The rest of these titles can describe a small business. They are defined low risk low reward occupations compared to true entrepreneurial ventures. All worthy of an SBA loan yet none garnering the attention of Angels and VC’s. Consistent with the grave digger roots, most real entrepreneurs fail – over 90%. Why anyone would choose the path transcends the understanding of most rational hardworking individuals. Still we ought to thank entrepreneurs for all their transformational technological advances, and for the ones yet to come. Thank them for their convictions, their passion, their unwavering ideologies, and their beliefs in all things completely different. In these times where six individuals are chasing each one job…perhaps its not a bad thing the term entrepreneur is increasingly tossed about. After all necessity is the mother of invention. Could robust job creation be far behind? On a final note, I am in total agreement with you about the self proclaimed “serial”. That’s just pretentious. Interesting take and very engaging read Irene. I agree to a certain extent. For me the term serial entrepreneur implies some lack of stick-to-itiveness. Someone who is always jumping from one business to the next at the blink of an eye. And I like the fact and the attitude that you have taken to strive to provide long term, substantive solutions to the people that will benefit from your business. However, I can’t give you any examples now, but I believe I have heard very successful business owners who are committed to being of long-term service use the term also.